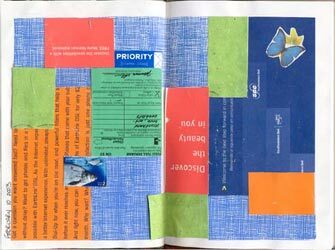 I’m drawn to films about art and artists—and since my favorite thing to do when I’m not in my own studio is to watch DVDs, I’ve seen a lot of them. In making this list, I focused on films made in the last thirty years. 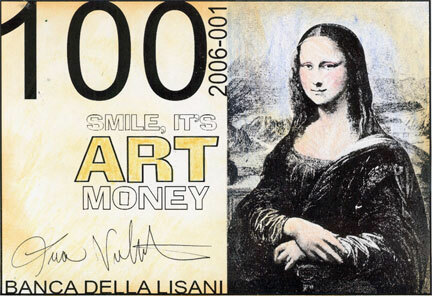 Obviously, there are some great classic films dealing with art and artists, but I’ll leave those for someone who is focused on older flicks. Also, I had to have seen the film to include it here—and I don’t generally watch foreign films, because I find subtitles distracting. 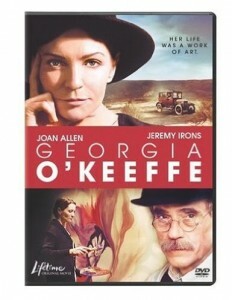 Joan Allen stars as the 20th century painter, with Jeremy Irons as her husband, photographer Alfred Steiglitz in this made for television film. This film is a little slow in places, but I enjoyed watching the progression from woman in the shadow of a famous husband to strong, independent artist. Tyne Daly plays O’Keeffe’s friend Mabel Dodge Stern. This is the only film that has been allowed to shoot on the property where O’Keeffe lived, so the scenery mirrors her paintings beautifully. Here’s an AP interview with Joan Allen about this film. John Malkovich stars in this bizarre film about the Austrian painter. I wasn’t really sure if I was watching a biography, a fantasy, or some weird syphilitic dream Klimt was having on his deathbed. My biggest gripe was that there was very little of Klimt’s artwork shown in the film. It’s worth seeing, though, just for the entertainment of trying to figure out what the heck you’re seeing, and also for John Malkovich, who embraces the insanity, full-on. 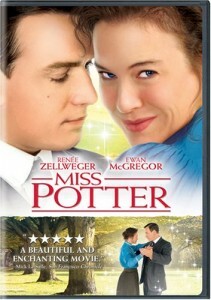 Renee Zellweger stars as author and illustrator Beatrix Potter, in a film that is as sweet as one of her stories. Potter’s illustrations occasionally jump off the page and do silly things, but other than that, this is a lovely, simple little film. Here’s a long trailer for Miss Potter. Nicole Kidman stars as photographer Diane Arbus in this film, titled “Fur: An Imaginary Portrait of Diane Arbus”. Don’t think of this as a biopic; it’s more of a dark fairy tale. Arbus was known for her strange photographs, and this film follows in that vein. Robert Downey Jr. plays Arbus’ strange neighbor, who introduces her to a whole world of—well, that would be giving away too much. It’s a deliciously creepy film, and captures the look and spirit of Arbus’ photos beautifully. 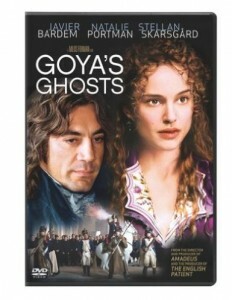 Stellan Skarsgard stars as Spanish painter Francisco Goya, with Natalie Portman, Javier Bardem and Randy Quaid rounding out the cast of this dark, haunting film. 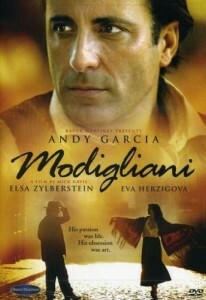 Andy Garcia stars as painter Amedeo Modigliani. The film focuses on his friendship and rivalry with Pablo Picasso, I found this film a bit uneven, but I liked it enough to watch it more than once. Based on the best-selling novel. Colin Firth and Scarlett Johansson star as painter Johannes Vermeer, and the housemaid that supposedly inspired his famous painting. Based on the best selling book of the same title, this is basically a romance set against an arty background. Pretty, but kinda fluffy. 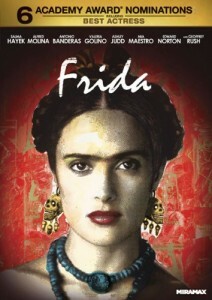 Salma Hayek stars as artist Frida Kahlo in this Julie Taymor film, with Alfred Molina as her husband, Diego Rivera. 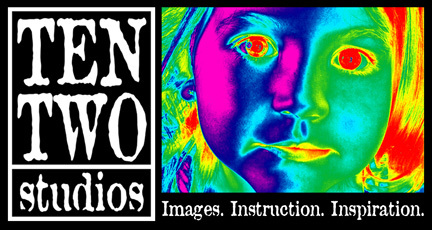 Taymor mingles a very serious biography with fantasy clips of Frida entering the world of her paintings. I love this film! 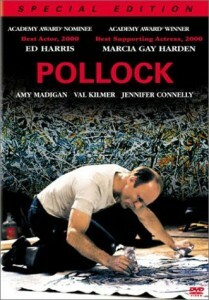 Ed Harris stars as painter Jackson Pollock, and also directs this film. Both Harris and costar Marcia Gay Hardin were nominated for Academy Awards for this film (Hardin won best supporting actress). 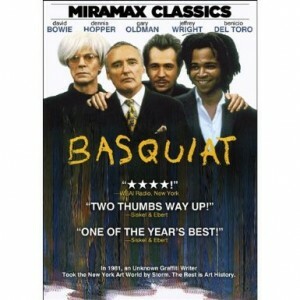 Not an easy film to watch, but brilliant in the way it portrays the artist’s torment and self-destruction. Director Julian Schnabel’s biopic about painter Jean-Michel Basquiat’s rise from homeless street artist to the darling of Andy Warhol’s set. Jeffrey Wright is excellent as the painter, and seeing David Bowie play Andy Warhol is a real treat. 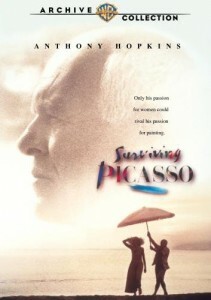 Anthony Hopkins stars as painter Pablo Picasso in this Merchant Ivory film. It’s an unflattering portrait of the artist, who is portrayed as a womanizing, self-centered jerk. 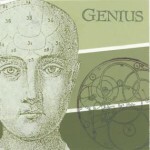 Picasso’s art work was not allowed by his estate to be used in the film.